Tip 0: Must I have 4 H2s? 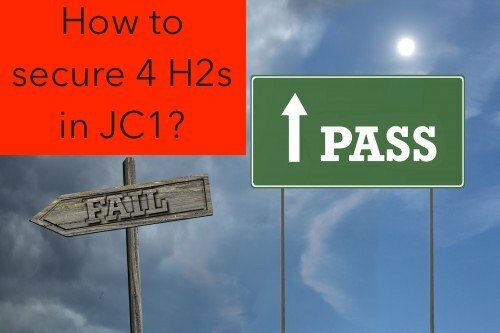 Why this is Tip 0 is because before you set your mind to bringing your 4 H2s on to JC2, think about – Do you really have to keep the 4 H2s? Why do you have to? Realistically-speaking, would you do better if you had only 3 H2s and 1 H1? Before I decided to drop my H2 subject, I was very stubborn as well, thinking that 4 H2s would definitely seem better on paper than 3 H2s and 1 H1. However, think about the less time you can spend on your other subjects if you choose to continue with 4 H2s. And with that reduced amount of time, will you still be able to well for your 4 H2s? I dropped my H2 Chemistry to a H1 and this freed up lots of time for me to revise my other H2 subjects, especially the practice-intensive Mathematics. Universities and scholarship providers (unless otherwise stated) would generally prefer someone who got AAA/A for 3 H2s and 1 H1 as compared to someone who got ABCD for their 4 H2s. If you’ve decided to try keeping all your H2s, here are 2 big tips to help you out! Count your blessings, J1s! If you really get down to work, you’ll find that with determination and good planning, you can finish polishing your basics and gain a strong foundation within a manageable amount of time! For A level subjects, you should know it is very difficult to catch up once you lag just a bit. But this difficulty will only increase in JC2! Don’t give yourself a chance, start now. Who knows? You could fall in love again with subjects you thought you hated but start to appreciate once you actually understand them better. Go for teacher consults, do many practices, attend (and stay awake for) all your lectures, seek external help if you need to. It is still not too late. Tip #2: Know your school requirements! Different schools have different requirements for students who are qualified to hold on to their 4 H2s. If you are bent on keeping your 4 H2s, know the requirements and aim to at the very least meet them. Many students find that they are unable to cope and end up having to drop their H2 after Promos without even knowing the requirements or even that there were requirements in the first place! As a previous A level student myself, I understand how stressful this period is, especially when it seems like there’s just endless stuff to catch up with. Do seek external help if you find that that will help relieve the pressure!